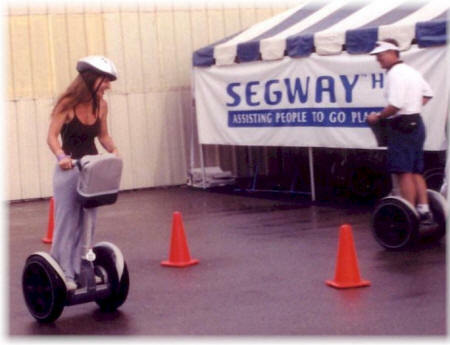 You may have already heard of Dean Kamen’s Segway Human Transporter (shown above), the two-wheeled gyro-stabilized wonder designed to increase individual mobility. But have you heard of his earlier creation called FIRST? FIRST (For the Inspiration and Recognition of Science and Technology) is a robotics competition for high school students that is intended to transform education rather than transportation. Teams from different high schools compete against each other by creating robots designed to perform specific tasks. The competition combines high technology and teamwork to make high tech education exciting. Kamen started this competition in the 1980s to encourage kids to enjoy learning science and engineering. Beginning with several dozen schools, the competition has grown to over 700 schools. In 2002 there were 23 US cities involved, six more than the previous year, and the competition is still growing. The contest is not limited to the United States as it also has competitors in Brazil, Canada, and the United Kingdom. Speculating on how US culture might be changed, Kamen asks, “Why can’t we build an organization that does for inventing what the NBA does for basketball?” He points out that many underprivileged kids “cannot name an inventor, but can name many athletes, singers, or entertainers. Many see becoming an entertainer, singer, or athlete as the only option to low wage jobs. It’s either the NBA or flipping burgers. Winning the state lottery is more likely than becoming an NBA star. Show them (kids) the NBA of learning and not the kids playing in the back yard. They need to see young adults who are excited about engineering and science. If they see them, then the kids will see engineering and science as accessible.” For over a decade FIRST has been making this dream come true. If you are a “techo” already out of high school and don’t want to miss out on the competition, don’t worry—FIRST is not just for students. Engineering mentors are also involved in the contest. Many of these volunteers find the competition helpful in building better teamwork and technical skills that they can use on the job. Private and public companies that sponsor FIRST benefit in the short term by letting their engineers have fun and in the long run by growing the engineers they will need in the future. “The students, companies, and country win,” says Kamen. When sharing his outlook on the benefits of science and technology in the future, Kamen commented, “Technology creates wealth and a better life. The wheel, fire, and language have all made life better. If we understand and apply technology to solve problems, this will continue.” Through FIRST he hopes to help keep this vision alive. To find out more information on how to become a sponsor or mentor in Dean Kamen’s FIRST Robotics Competition and the new FIRST LEGO League for kids aged 9-14, visit www.USFirst.org. If you would like to learn more about the Segway and new projects such as the improved Stirling Engine currently under development by Kamen’s company, DEKA Research & Development Corporation, go to www.dekaresearch.com. 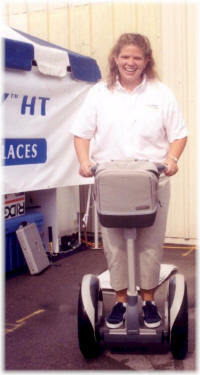 Click here to see one of Dean Kamen’s Segway patents US 6779621 (PDF format). Articles and photos contributed by Planet Patent’s Glen Kotapish. Glen is a writer, patent searcher, and a member of the Inventors Network of the Capital Area (INCA). INCA’s website is www.dcinventors.org. He can be reached at his e-mail, search@planetpatent.com. Note: This article first appeared on Patent Cafe’s, www.patentcafe.com, online intellectual property magazine Cafezine, www.cafezine.com.